I made some cookies last week. They are giant. They are crunchy and chocolaty. They are chewy and delicious. I've made these for a few years now because my kids love them. I found the recipe here. I always double my cookie recipes (especially this one) because each cookie takes 1/4 cup of dough. Heat oven to 350. Mix brown sugar, butter, shortening, honey and egg i large bowl. Stir in lour, baking soda, baking powder and salt. Stir i chocolate chips and brickle chips. 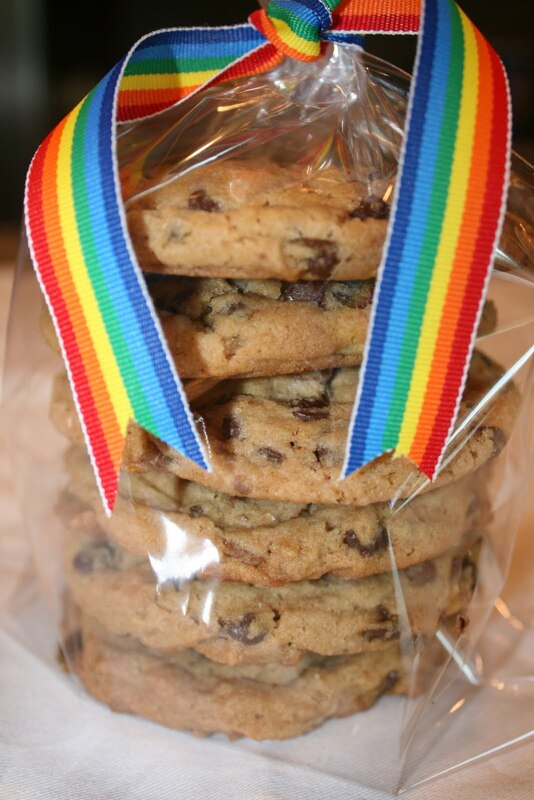 The cookies are packaged cute on a plate but much cuter in a cellophane bag with a ribbon. But look how stinking cute they are packaged in CD envelopes. My daughter took these to share with her friends at a school activity. 2 Response to "Giant Cookies"
Jody, I laughed out loud with the don't judge me comment. Man I miss you!! Love the cookies in the CD sleeve...cute idea! It is late...sorry I misspelled your name...what is up with that...as someone who gets their name misspelled often...I apologize!! !